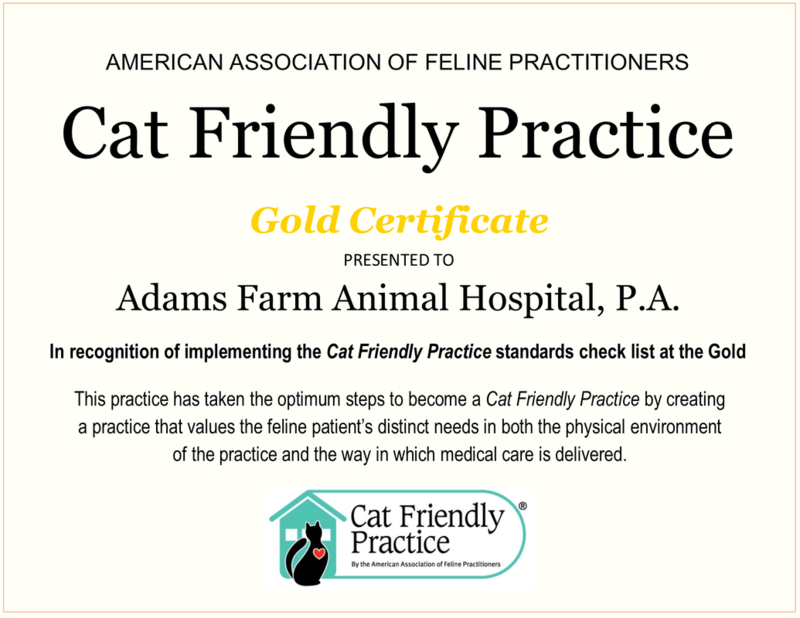 Cat Friendly Practice - ADAMS FARM ANIMAL HOSPITAL, P.A. As a member of the family, your cat deserves the very best possible care. One of the best ways to ensure your cat stays healthy is by making sure they have a preventive care examination or check-up yearly, or more frequently for senior cats and those with chronic conditions. 1. Cats Age Much More Rapidly Than Humans. A cat reaches the approximate human age of 15 during its 1st year, and then the approximate human age of 24 by its 2nd year. Each year after, your cat ages approximately 4 “cat years” for every calendar year. So your 8-year-old cat would be 48 in human years. Annual veterinary care is crucial because a lot can happen in our “cat years,” which is why yearly visits are so important. 2. Cats Are Masters at Hiding Illness. Cat’s natural behaviors make them excellent at hiding signs that they are sick or in pain. Your cat could be developing a health condition long before you notice anything is wrong. Veterinarians are trained to spot changes or abnormalities that could be overlooked and detect many problems before they advance or become more difficult to treat. 3. Your Cat May Be Overweight. Over 50% of cats are overweight or obese. Your veterinarian will check your cat’s weight at each visit and provide nutritional and enrichment recommendations to help keep your cat at an ideal weight. Just an extra three pounds can put your cat at risk for diabetes; heart, respiratory, and kidney disease; and more. 4. Preventive Care Is Better Than Reactive Care. Information discussed, along with a thorough physical examination, allows you and your veterinarian to create a plan to help your cat remain healthy. Regular check-ups can help avoid medical emergencies since veterinarians can often detect conditions or diseases that may affect your cat’s health long before they become significant, painful, or more costly to treat. 5. Kittens Have 26 Teeth, While Adult Cats Have 30. ​That equates to a lot of dental care! Periodontal disease is considered the most prevalent disease in cats three years of age and older. Often there are no obvious signs of dental disease. Most cats with dental disease still eat without a noticeable change in appetite. Discuss your cat’s teeth at their routine preventive care veterinary visit.